"The following is the translation of the latest blog entry from Nyi Lynn Seck titled "Budget Huts Plan". NLS has agreed to post it on MOEGYO blog. It's a good recount of an aid worker's experience and his on-ground thinking. The original blog entry is at http://nyilynnseck.blogspot.com/2008/05/budjet-hut-plan.html. MOEGYO is contributing funds for this plan. " 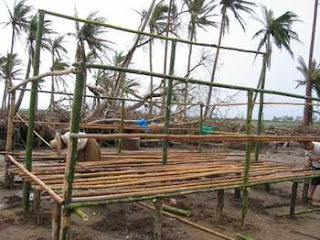 From now on, we plan to build affordable huts for survivors of the cyclone, rather than giving them food and clothes. When we ask them what they need most, they tell us that they most urgently need housing and want to return to their farms.Out of a population of 500, one village has only 100 survivors left. About 30-40 are women. Most of the female survivors we met, don't want to return to the disaster areas yet, the place of their grief. Most of the men want to return even if authorities forbid them. There are 2 kinds of cyclone victims - those who have reached the city and others who have not bothered to make it to the city. Everyone you meet in the cities aren't victims and every victim is not yet in the cities.We meet the real suffering victims upon travelling to the villages. Some villages have received aid from planes but it is not enough. Some villages are still not accessible due to the road conditions. These victims grew up and made their living on the rivers and lakes, therefore they don't seem overly worried about food. So long as there are rivers, finding fish and shrimps are not difficult. They are mostly worried about not being able to return to farming. They have to remove the salt water from the farmlands which were overswept by the rising tides. They then have to plow the soil. To do all that work, they first need a place to stay with a roof over their heads. Building a house had its own obstacles. - One was transportation. Some seaside villages require about five hours to get to by normal boats. Since many boats drowned during the cyclone, there are not enough boats to go around. It would be costly to permanently rent a boat. The first village that we built huts for - had a boat fortunately, and we only had to pay for fuel. - Second obstacle was getting bamboo. 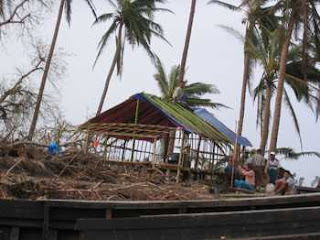 The cyclone devastated many bamboo forests. Therefore, bamboo was hard to find. The distance of bamboo (from the village) would bring up the cost. The reason for choosing bamboo over wood will be explained later. - Third obstacle was general use items. These are now very expensive in affected areas, so we are having to transport them from Yangon. The huts we built are not for single family use. Our discussions with the survivors tell us that they do not want to move whole families back to the village. Their plan is for the men to return first, a village's men will form and work together on a community farmland of 10-15 acres (they used to work on hundreds of acres on their own before), and they will continue to expand and grown on this year's crop. I look at them and I get goosebumps. Even in such disaster, they are forming long-term plans, why can't we plan long-term too? So, we discussed with them and they told us that they want to live together in group-houses, not one-family-one-house yet. They won't live in these group-houses forever. But about 3 years for sure. After that, they will try to build separate houses. We therefore agreed upon building affordable huts for 2-3 year living. Our budget huts are 20 x 15 feet. A kitchen of about 6x6 feet is attached. 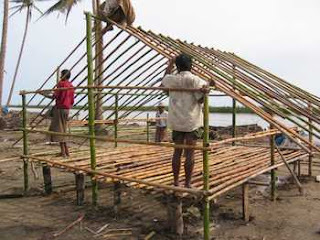 Hut will be built using bamboo. Tarpaulin <http://en.wikipedia.org/wiki/Tarpaulin> will be used for roofs and covers. Some are asking why "da-neet" is not used. - The reason is simple, many houses in these areas had their roofs redone with new batches of da-neet for the upcoming monsoon season - just before the cyclone hit. Thus, da-neet leaves that are growing now are fresh and still not hard enough to use for housing. - Second reason is lots of women who used to make living as da-neet weavers have perished in the disaster, thus there's nobody to weave da-neet. So, tarpaulin - a bit more more expensive, but faster, easier and workable - was substituted. Reason for using bamboo instead of wood is that wood is more expensive and hard to transport. Even if wood was donated from Yangon, it'd be difficult to first transport wood to Laputta, then to villages that need it. These victims don't have any money. Any matter that would unnecessarily complicate their minds should be avoided. We call such huts 3x2 and 1-attached. Meaning there're six small rooms in a hut (with an attachment). One room is big enough to comfortably house 2 persons. A hut can house 12 people. Building five huts cost about 1,000,000 kyats ($850). A hut costs 200,000 kyats ($170) and one person's cost will be about 20,000 kyats ($17). These are actually really affordable housing. These are more necessary now than big permanent houses (taking months to build) for them. 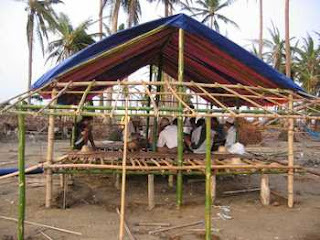 The villagers can build the huts themselves. We provide the meals while they are building. By having them take part in building these huts, they also get a sense of contribution and understand that not everything can be given to them as gifts. After such huts are built, we will work together with other related NGOs to arrange sanitation and water. The cyclone took many lives. However much they are controlling their emotions, they have suffered much emotionally. Parents, siblings, spouses perished right in front of their eyes. We cannot feel we have done our jobs just by returning their lives to normal. We have to work and help them achieve something extra out of their losses. If their sanitation was not proper before, and it remains unchanged now - that'd mean surviving this ordeal didn't make any change in their lives. Nothing improved. We need to help them improve their state of mind, living standards and education. That's the only way their surviving of the cyclone would make any sense. In other countries, there exist groups which console and help the victims. Why don't we have such groups? I'm saddened by this fact.There're about 100,000 displaced refugees. If we built such "budget huts" for every one of them, the bill will amount to 2 billion kyats. Our funds are minute compared to that huge number. But we will build as many huts as we can afford. If you wish to donate huts, you can calculate based on the information above, and donate for x number of villages, x number of huts, and so on. You don't have to send it though us either. Anyone can go down to these villages and analyze the on-ground requirements, and make useful contributions to help the victims.